We've got Mother's Day covered! Gift all the women in your life incredible products that will make them look and feel young and radiant! Now through May 11, buy one Trulūm Pack and get a Trulūm Basics Pack for $50! That's a $99 value! In addition, the first 100 orders will also receive a special edition Trulūm spa headband, cosmetic case, and compact mirror. 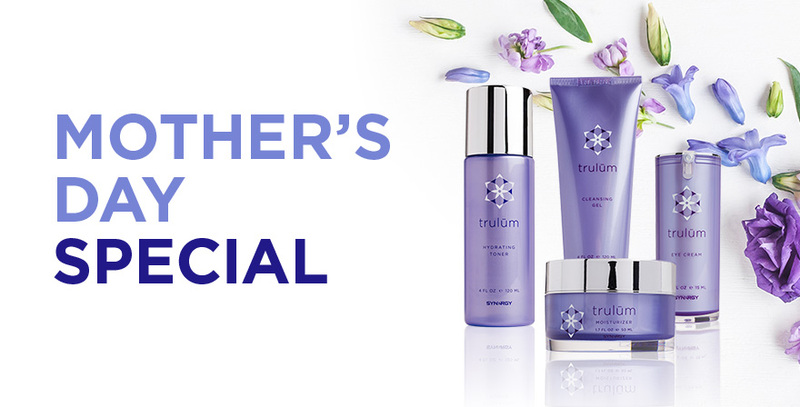 Mother's Day Trulum orders must be called in to Synergy Customer Service: (801) 769-7800. Customer Service is available to assist you Mon-Thurs 8:30 AM-5:30 PM (MDT) and Friday 8:30 AM-5:00 PM (MDT). Every Trulūm Pack order comes with a Trulūm Guide featuring science info, product details, and application instructions. Buy one for yourself and gift one, gift both, or buy as many packs as you'd like to gift to all of the wonderful women in your life.